Ecuador is increasingly a country of city dwellers; its urban population exceeded 50% of the total for the first time in the 1990 national census (INEC, 1990). The urban areas of the country are dominated by two cities: the economic and export agriculture center of Guayaquil on the coast (1990 urban core population 1.5 million, metropolitan area population 2 million), and Quito, the highland capital city (1990 urban core population 1.1 million, metropolitan area population 1.3 million) (Map 2.1). Together these cities contain 48% of the total urban population of the country, and 27% of the population of the country as a whole (Suárez Torres, 1992). In its bipolar urban development, Ecuador does not follow the pattern of many other countries of the developing world which are completely dominated by a single city. While the growth of Quito and Guayaquil has been remarkable since the 1970s, the explosion of a single megacity has been avoided in Ecuador. In fact, the population growth of the two dominant urban centers has been accompanied by the simultaneous steady expansion of several intermediate sized cities during the last few decades (Suárez Torres, 1992). Before detailing the specific components of the urban forest and urban forestry in Quito, the limits of the urban area under consideration must be defined, ideally in a way that incorporates important measures of both biophysical parameters and social indicators. Fortunately, in the case of Quito, a newly designated political unit largely corresponds to both social and ecological zones of urban influence. The Quito Metropolitan District (Distrito Metropolitano de Quito) was officially created and sanctioned by national and local governments in 1992. With some exceptions, this area will serve as the operational definition of the Quito urban ecosystem in this case study. While by no means a perfect mirror of the natural boundaries of the watersheds, wildlife home ranges, or ecological life zones of the metropolitan region, the District represents a reasonable approximation of the spatial area and natural resources most directly influencing and influenced by the processes of urbanization in the capital city. In addition, the single political jurisdiction of the metropolitan zone incorporates most of the human population affected by both public and private efforts relating to local natural resource management, likewise making it a logical framework within which to analyze existing actions and recommend improvements in the Quito urban forest. Although adequate for most purposes, the strict political limits of this area will be extended to include other jurisdictions of relevance when necessary for the discussion of specific issues. The Quito Metropolitan District is located in Pichincha Province, situated in the north central zone of the Andean Cordillera which bisects Ecuador from north to south. The Province has a total area of 1,358,100 hectares (IMQ, 1992b)1 of which the Metropolitan District comprises over 290,746 hectares, including the city of Quito proper as well as 24 suburban and rural parishes surrounding the urban core (see Map 2.2.). Within this broadly defined metropolitan region, the urbanized zone covers 37,091 hectares, delimited as the Quito urban area per se, surrounded by approximately 253,655 hectares of peri-urban, suburban and rural zones (IMQ, 1992b). 1 This figure is taken from municipal planning documents, although another source cites a total provincial area of 16,560 km2 Terán, 1984). The ecosystem approach calls for considering the entire metropolitan area as a single integrated management area, and the linkages between the urban core and surrounding areas will consistently be emphasized in this study. However, in recognition of the great internal diversity present within Quito's urban forest ecosystem, the strictly urban core will often be addressed separately from the peri-urban portions of the metropolitan area (see Box 2.1). This approach respects the significant biophysical, social, and political differences between the two zones, which call for different management strategies for each zone. The urban forest ecosystem, and the metropolitan area in general, are not spatially or ecologically uniform. The type and amount of vegetation, as well as the functions this vegetation serves, vary considerably depending on the nature of the specific urban space where it is located, as well as the broader "type" of urban context surrounding the planting site. One way of understanding these differences is to examine them in the context of the "urban-rural gradient", or more appropriately, the "urban forest ecosystem gradient". In the typical metropolitan area, there exists a range of different "zones" which roughly correspond to the distance of a neighborhood or sector from the urban core. Although local variations certainly exist, areas closest to the city center are usually characterized by higher human population density, a higher proportion of built area, lower vegetative cover and biological diversity, more introduced and artificially maintained vegetation, and more "urban" human values associated with the vegetation which does exist. Both public and private lands are present in these sectors, but all typically fall under the single jurisdiction of municipal government agencies. In contrast, as distance from the city center increases, average lot size may increase, there is frequently more publicly owned land, more original vegetation and other life forms may exist along with human-planted cover, and more "rural" values are often attributed to the plants present. In the cities of developing countries, there are also often pockets of high-density spontaneous housing development in outlying areas, often in ecologically sensitive sites. In all these peri-urban zones at the metropolitan fringe, mixed political jurisdictions may be the rule as it pertains to the management of the environment or natural resources in the zone. As was already mentioned, each point along the urban forest ecosystem gradient has a number of different possible types of urban planting sites, which further define the kind, amount and functions of the vegetation present. These specific site types are discussed in more detail in more detail in Box 3.1. Quito's urban forest must be understood in the context of the historical and current conditions of the urban socio-ecosystem of the region. These defining elements will be discussed under three broad headings: Biophysical Characteristics; Social and Economic Characteristics; and Legal and Institutional Characteristics. · Topography: The urbanized portion of the Quito metropolitan area is situated in a narrow mountain valley just east of the foothills of the active volcano Pichincha. Prehistorically, the site on which Quito sits had been a crossroads on important trade routes through the Andes, due to its location in one of the few accessible passes through difficult mountainous terrain. Defense considerations for the original indigenous populations, as well as the Inca conquerors and the Spanish colonial regimes, also contributed to the selection of Quito as the location of a capital city (Moore, 1984). In modern times, the "natural barrier" of the mountains has largely forced the spread of the city to occur in a longitudinal, crescent-shaped fashion (DeNoni, 1986), so that the consolidated central urban portion of the metropolis is now about 5-8 kilometers wide, and over 30 kilometers long. While humans have found it possible to overcome some of the physical limitations which restrict settlement on the mountain slopes, questions of access, provision of water supply, and the risk of natural disasters continue to impede intensive development in these steep areas. 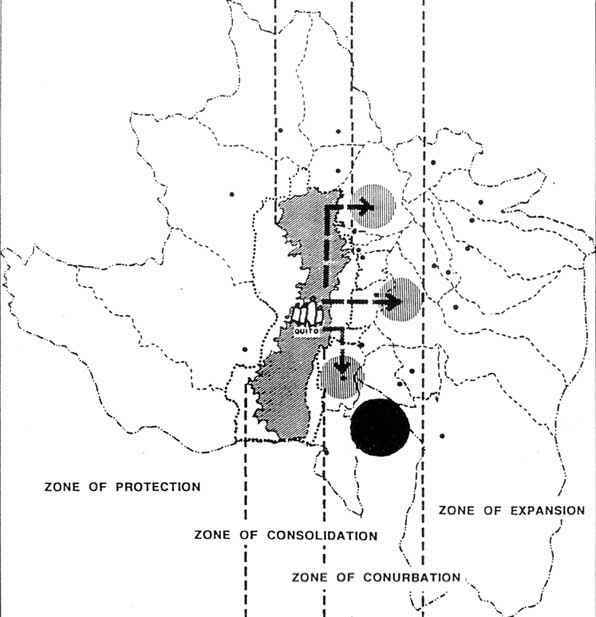 In the peripheral zones outside the urban core, development has likewise moved fastest in several subsidiary valleys and plains stretching out to the east and south of the main city between ranges of hills and other steep land (Map 2.3). · Hydrology: The Quito metropolitan area is found within the Guayllabamba hydrologic sub-basin, an extensive inter-Andean drainage network conformed by parallel Cordilleras of the Andes on the east and west, and constrained by transversal volcanic ranges to the north and south. Within this basin, and specifically within the Quito Metropolitan District, several important rivers flow, including the Guayllabamba River, the Machángara River, the Monjas River, the Pita River and the San Pedro River (IMQ, 1992c) (Map 2.4). · Soils: Virtually all the original soils of the metropolitan area are of volcanic origin. In outlying areas, on the western ridges of the mountain ranges of the zone, the dominant soils are deep, fine textured pseudo-sandy loams (e.g., Dystrandepts). These soils have extremely high moisture retention, but are not considered suitable for agricultural use due to their location in steeply sloping areas. The most important agricultural zones of the metropolitan area are located in Puembo, Pifo, Yaruqui, Checa, Tumbaco, El Quinche, Amaguaña and Píntag. The predominant soils in these areas are deep (> 1m), black volcanic soils with some presence of silt, and less than 30% clay content (e.g., Plustols, Arglustolls, Pludolls). Similar soils are present in the zones of Lloa and in south Quito. Erosion levels are alarming throughout the metropolitan area. River basins and ravines are especially affected, as are the sandy pyroclastic soils in Calacalí, Calderón, San Antonio and Pomasquí. The hard layer of Duripan ("cangahua") found approximately 1 meter under the slopes of the western ridge, is also exposed to erosion (IMQ, 1992c). A sampling of soils in the city core area found that soil texture is relatively homogeneous in urban sites throughout the city. They are mostly loamy, with a predominance of sand. Man-made material (e.g. construction rubble) is also found in many places, and soil depths are extremely variable. Organic matter content of the soils is low (less than 2%) or medium (between 2-4%), available nitrogen and assimilable phosphorus are low, and potassium levels are medium. Soil pH ranges between 6.4 and 8.0 (Gangotena et al., 1990). · Climate/Ecological Life Zones: Ecological life zones, or geographic areas with similar biophysical and climatic characteristics, influence the pattern of land use and vegetation, and thus, the development of urban forestry. The Quito Metropolitan District, including the urban core as well as the outlying urban-rural interface area, covers eight different ecological life zones as defined by the Holdridge system (1967), plus two transition zones. Three of these Holdridge zones (plus one transition zone) are present within the urbanized core region (Map 2.3). The zones present in the District are listed along with their general defining characteristics in Box 2.2. · Dry Interandean Zone: located in the low valleys in the extreme northern zone of the metropolitan region, near the Equator (i.e., San Antonio, Calderón, Guayllabamba). These are areas of 1500-2800 m. elevation, with an average annual precipitation of 554 mm/yr. The main rainy season is from September to November, while the minor one is from December to April. The dry season is from May to August, when temperatures are high, and there is virtually no precipitation. Temperatures average around 16-18°C. 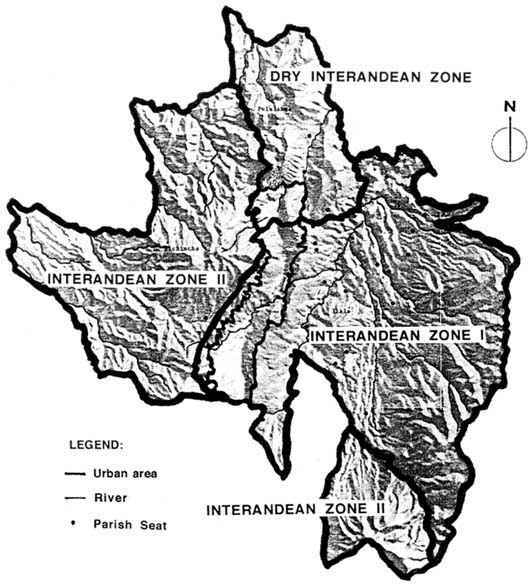 · Interandean Zone I: located in areas between 2400-3100 m. elevation, including the major portion of the city of Quito itself, as well as the eastern and southern temperate valleys of the region (i.e., Cumbayá, Tumbaco, Puembo, Pifo, Yaruqui, El Quinche, Checa, Nono, Calacalí, Nayón, Zámbiza, Lloa). The main rainy season is from September to November, with a less pronounced rainy period from December to April, and a dry season extending from May to August. Average annual precipitation is about 960 mm/yr. Temperatures average around 10-16°C. · Interandean Zone II: including the higher zones of Píntag to the southeast and the mountain range to the west. There is a rainy period from September to April, and a severe dry season between May and August. The total annual precipitation averages around 1400 mm. Temperatures average around 10-16°C. Both characteristics of the human population as well as factors having to do with the interaction of human populations with the land are relevant to the social and economic context in which management of the Quito urban forest ecosystem takes place. · Population Growth: The City of Quito was founded in 1534 on the site of an existing Inca settlement, with an original foreign population of 203 Spanish and two African men. 2 Table 2.1 presents population figures available from the time of colonial settlement to the middle of the twentieth century. Despite serious quality problems with some of these data, a general pattern of moderate growth is apparent from the sixteenth through the end of the nineteenth century. *One exception to the general trend of population growth is a decline in population just after Independence in the mid-1800s, primarily attributable to the disruptions of war and disease during that period. Sources: data from 1534-1748 in Moore, 1984; data from 1779-1950 in IMQ, 1992d. In this century, urban growth in Ecuador has greatly accelerated, especially in the country's two major urban centers, Quito and Guayaquil. Rural in-migration has led both to the densification and extensification of human settlement throughout Quito and its environs (Adriani, 1987), especially since the 1970s. Although migration is slowing somewhat in recent years, in 1990, 35% of the existing urban population had originated in some other location (INEC, 1990). Population growth figures since the 1950s are presented for Quito compared with other territorial breakdowns in Tables 2.2 and 2.3. These data not only demonstrate the rapid overall population growth of the city, which has averaged about 4.4% annually between 1970-1990 (IMQ, 1992e), but give interesting insight into the relative growth rates of the "urban" versus "rural" portions within the metropolitan zone, compared with national and regional figures. A clear trend of urbanization is shown, especially within the outlying areas surrounding the urban core. · Population Distribution: Population density figures also show a pattern of increased concentration in distinct centers within the rural-urban "interface" (i.e., peri-urban and suburban areas), at the same time that the amount of unused land within the metropolitan region has skyrocketed (see section below on Spatial Growth and Political Boundaries). 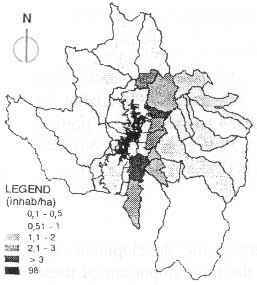 Map 2.5 is derived from a 1986 study on urban expansion in Quito (DeNoni, 1986), and shows overall decreasing population densities with increased distance from the urban core, but with the development of clear urbanized centers within the interface zone. 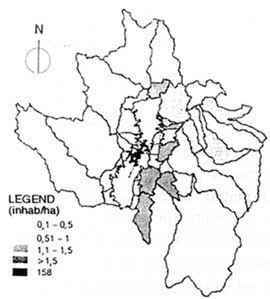 Map 2.6 shows density changes in the urban and rural parishes within the Quito metropolitan area since 1950. The 1990 census figures tell the same story: gross density rates for Quito proper were 57.4 residents/hectare, while in the outlying zones, the average density was only 1.02 residents/hectare. However, this latter population was largely clustered in urbanized centers within the parishes (i.e., the parish seats), where population densities averaged 14.03 residents/hectare compared with 0.48 residents/hectare in the rural parts of the parish (IMQ, 1992c). · Economic Activity: The urban socio-ecosystem of Quito is by no means uniform; different regions within this zone have presented different economic opportunities and limitations for human settlement. In general, on the west side of Quito, topographic barriers have made productive land use difficult for both the traditional and "modern" economic sectors. In the lower portions of this area, steep slopes, unstable soils and difficult access have limited urban construction and agricultural cultivation alike. Higher up, páramo grassland areas above 3800 m. have been little inhabited, largely due to their inhospitable climates and the difficulty in cultivating the land. The valleys extending northward out of Quito, despite their semi-desertic climate, have permitted more human settlement and even considerable agricultural activity, especially in irrigated bottom lands. The fertile and warmer valley lands to the east and south of the city have absorbed the most population expansion of all, largely due to their greater capacity to provide a livelihood for people. The distribution of "rural" versus "urban" uses of the land in various sectors of the metropolitan district provides additional insight into urbanization patterns and rate of change of the urban socio-ecosystem. Service sector activities (urban land uses) dominate in the consolidated city core, while construction and industrial activities (also urban land uses) are becoming increasingly important in the near periphery. In the distant interface zone, agriculture, fishing and hunting (rural land uses) are dominant (IMQ, 1992a). An examination of the types of employment in which the urban and rural populations of the region are engaged gives a similar view. As a whole, Quito's economy is dominated by the tertiary sector, with 37% of the total population of the Metropolitan District employed in services, followed by 18.4% in commercial activity. 17% of the total population works in manufacturing and industrial occupations. Certain areas within the metropolitan region, however, tend towards concentration of particular economic activities. The extreme outlying suburban regions to both the east (the so-called Oyambaro area) and west (the Ungüi area) contain the highest concentration of population tied to the primary agricultural sector. The center-north and center-south urban districts of Quito (the Urinsaya and Yavirac areas), as well as the northeastern and southeastern suburban valleys (the Carapungo and Los Chillos areas) contain most of the population labouring in the industrial sector. Unfortunately, no data were available to measure the types and rate of change over time occurring from rural to urban economic land uses or employment types in Quito's urban-rural interface zone (IMQ, 1992a). · Land Tenure: A strong determining factor in the spatial development of the Quito urban area has been changing patterns of land tenure, including modification in land ownership in the urban periphery driven by land reform policies. Most of what is now the Quito Metropolitan area was divided into large hacienda holdings during colonial times. The first national Agrarian Reform Law of 1964 resulted in the splitting up of many of these larger properties into small lots for distribution to poor landless farmers. The difficulties of conducting economically productive agriculture on very small lots, as well as general pressures of urbanization and the emerging private land market led to the sale of many of these holdings and their conversion to urban land uses. Land reform also fueled speculative activity and rapid urban spatial growth, as several of these large landowners either subdivided their land illegally in parcels destined for urban development or were invaded by urban poor seeking housing sites (Adriani et al., 1987). These processes created considerable fragmentation of ownership, and a change in both the character and intensity of land use from rural to urban activities, all ultimately contributing to drastically altered ecosystems. The typical land ownership and fragmentation process just described may be contrasted with the unusual case of one traditional rural communal land holding structure in Ecuador, the comuna, a few of which are still found within the metropolitan region of Quito. Although technically protected by law, these areas have been absorbed by the expanding metropolis, raising considerable question regarding their long-term viability. Some private interests and governmental representatives favour the dissolution of these "antiquated" ownership patterns which are considered an impediment to urban progress. They advocate the eventual full integration of these holdings into the private land market (Bustamante, 1992). In opposition to this point of view are those who believe that the comuna contributes a diversity of values to the urban-rural complex, and should be retained as an important cultural, economic and ecological alternative for the ownership and use of space (Kingman, 1992). Detailed data do not exist regarding the different ecological implications of such diverse land tenure arrangements, but it is interesting to speculate on which ownership structure would lead to the best preservation of urban ecosystem values in the Quito context. Presently, in a major urban green space within the Quito city limits, municipal administrators are working with members of a comuna located within park boundaries, to manage the park area and create employment opportunities (Guayasamín, pers. comm., 1995). In addition to private landowners, the public sector also possesses large tracts of land within the metropolitan region, primarily in outlying areas. Although no figures were available for the entire region, in 1984, nearly 13% of the total acreage of the 8,334 hectare western portion of the Pichincha Protected Forest and Vegetation zone (Bosque Protector Pichincha) was contained in large parcels (40-500 hectares) held by public agencies (Moore et al., 1984). 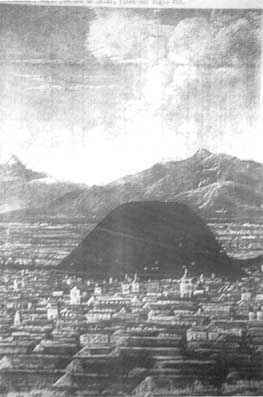 · Spatial Growth and Political Boundaries: The city of Quito has experienced an enormous spatial growth from its origins in the sixteenth century as a small colonial capital of 8 hectares, to today's metropolis stretching over 290,700 hectares. City officials have attempted to "rationalize" this growth by increasing formal control over the ordering of space, population distribution, and the capturing of economic benefits associated with such large agglomerations of people. Map 2.7 displays the extension of the political boundaries of the urbanized core area of Quito from colonial times to the early 1980s (Carrera, 1984). Map 2.8 shows the political boundaries of the newly created Metropolitan District of Quito and indicates a "natural" zone for future growth of the city towards the eastern valley area (now totally within the metropolitan territory), consistent with urban planning documents throughout this century. 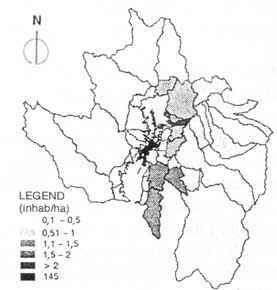 While population growth has been substantial within the Quito metropolitan area in recent decades, averaging around 4.4% annually from 1970-1990, the land area included under the municipality's jurisdiction has expanded at a considerably faster rate, averaging 9.7% annually for the same period. Among other causes, rampant land speculation has led to a problem of what city planners call "underutilized" urban space throughout the metropolitan area. Within the city core limits of Quito, about 43% of usable urban land (under both public and private ownership) was vacant in 1980, and there was about 27% unoccupied urban space in 1990. 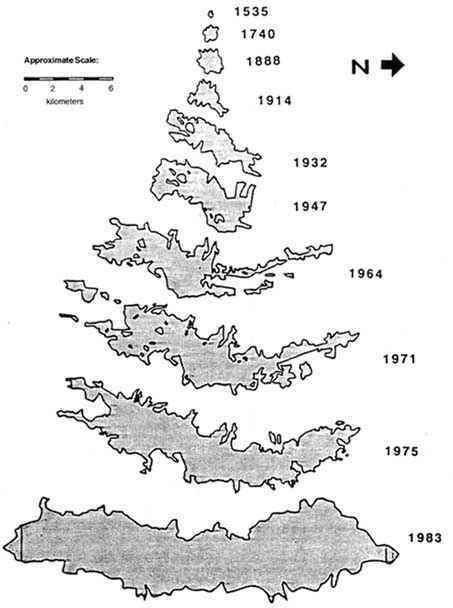 In the peripheral zone, about 34% of land was unoccupied in that same year (IMQ, 1992c). · The Quito Metropolitan District: The legal and institutional changes brought about by the establishment of the Quito Metropolitan District are of great importance for all aspects of future urban planning in the Quito metropolitan area, and are especially relevant to questions concerning ecosystem management throughout the region of urban influence. In 1992, the legally empowered Metropolitan District of Quito was formed (Ordinance No. 2955), which established more extensive jurisdictional, boundaries and set forth a new form of local government for the area. The Metropolitan District structure replaces the earlier, more disaggregated canton and parish system, and emphasizes the principles of decentralized decision-making and local diversity while broadening the total spatial territory included under its general authority. The new District comprises 16 central city and 24 suburban parishes organized into four central and six suburban zones. Elected representative councils exist at both the level of parish and zone, and each zone is managed by a zonal administrator appointed by the overall Metropolitan Council (IMQ, 1992b). Representatives from each of the zonal councils also have a non-voting seat in this law-making Council. It is hoped that the expanded jurisdiction and decentralized administration will favour a comprehensive regional approach to regularizing land use and service provision, while remaining locally responsive. The opportunities for more intensive and comprehensive local government intervention in the natural resource management aspects of the urban peripheral zones are clearly numerous under this new metropolitan scheme. · Municipal Planning and Regulatory Efforts: The control exercised by government over a given space only begins with the legal designation of its boundaries. Of more far-reaching relevance are the actual policies, laws and regulations which seek to shape human action within the designated border, and the level of political will attached to enforcing such standards. 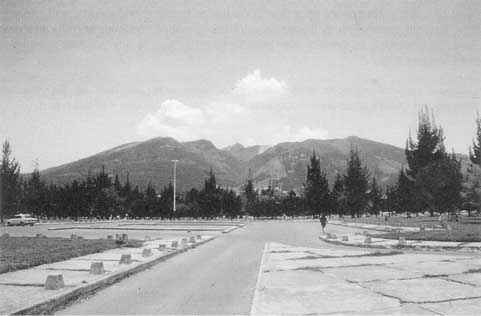 In twentieth century Quito, the history of municipal planning efforts reflects an evolving government approach in response to the rapidly changing urban and rural landscape. 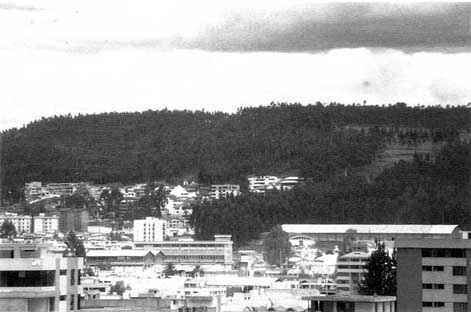 Major efforts in city planning in Quito from 1945-1985 are summarized in Appendix A. While these efforts signal a spirit of civic order which has historically set Quito apart from many other Ecuadorian cities, the planning efforts consistently underestimated the pace of growth of the metropolis, and rarely were backed up by a firm and appropriate set of ordinances and regulations, or other means of realizing the plans. The latest planning effort undertaken by the Municipality in the early 1990s has been the most ambitious of all, and has included a number of policies as well as revised legal instruments related to the management of the natural environment in the urban area. For example, in 1993 an extensive ordinance to guide urban development throughout the new jurisdiction was passed by the City Council (Ordinance No. 3050). This regulatory reform includes new measures regarding land use, zoning and territorial organization, as well as detailed regulations and permitting processes for buildings, subdivision of land, title transfers, etc. (IMQ, 1995). Laws related to air pollution and water contamination in Quito have also been strengthened, serving as models for other municipal areas of the country. Other efforts with a political and legal impact on the urban ecosystem are ongoing as well. In 1994, the mayor formed a special Direction of the Environment for Quito, which is charged with coordinating all actions relating to environmental quality of all municipal agencies, although to date there has been little strong policy or action regarding the urban forest emerging from this unit (IMQ, 1994). The metropolitan government is also responsible for maintaining a cadaster of all property holdings within its jurisdiction, and for collecting property taxes. Both efforts are undergoing modernization and computerization at this time. In addition, the Planning Department has made considerable progress in developing a Geographic Information System utilizing satellite information, aerial photographs and other data regarding all aspects of the metropolitan area, including some characteristics of the biophysical environment (Vallejo, pers. comm., 1995). There are few legal mechanisms relating specifically to urban vegetation and the urban forest ecosystem in the Quito Metropolitan District, however, these will be addressed in more detail in a later section of this report. · Other Governmental Jurisdictions: The modifications in Quito's formal urban boundaries over the years have been accompanied by changes in the relative importance of different levels of government in directing the extent and character of its spatial development. In colonial times, the influence of the Crown in this capital city was paramount, and certainly largely synonymous with municipal controls. With the formation of the Republic in 1822, the national territory of Ecuador was divided into a hierarchy of provinces, cantons, parishes and municipalities. In the management of the largest Ecuadorian cities such as Quito, all of these levels of government have been present to some extent throughout history, often with resulting confusion over jurisdictions and roles typical of rapidly growing urban areas. Today, the broadened powers of the new Metropolitan District give this newest level of government a primary role in guiding the course of development in the region. Nevertheless, other jurisdictions still do bear on certain aspects of management of the urban socio-ecosystem, and deserve some mention. 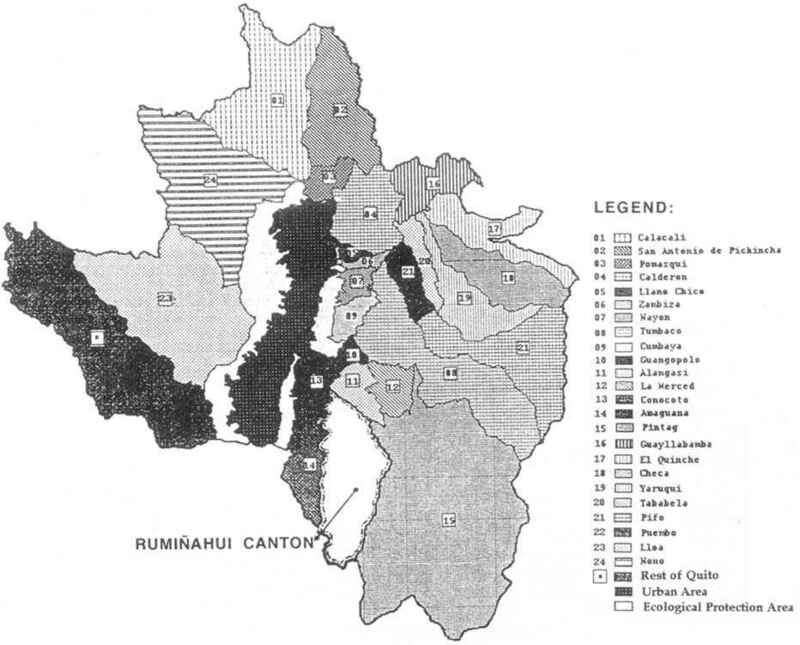 · Local Level: At this level, one jurisdictional anomaly stands out, i.e., the existence of the Canton of Rumiñahui, which has curiously not been subsumed within the new District boundaries, even though it is clearly within the suburban zone of the city of Quito (see Map 2.2 for exact location). This Canton has a total area of 13,279 hectares, and a 1990 population of 46,215 inhabitants, most of them in the city of Sangolquí. The canton and its main city Sangolquí have been able to remain legally autonomous from Quito throughout history, although a cooperative working relationship appears to exist between the two jurisdictions for planning purposes (IMQ, 1992b). 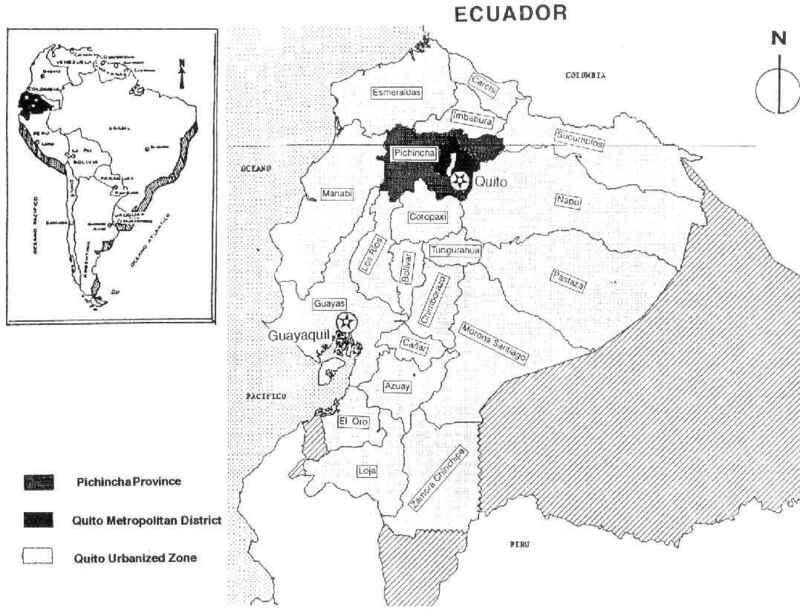 From the perspective of ecosystem management, the dominance of actions within the much larger Metropolitan District of Quito make it the more significant player, but it is important to keep in mind the need for political and institutional coordination in the event that programme impacts extend spatially into the area of Rumiñahui. · Regional Level: The role of the Pichincha Provincial government in the Quito metropolitan area has been minor throughout history, and reflects the relative weakness (both legally and financially) of this level of government everywhere in the country, and especially in provinces dominated by a single municipality. In terms of the management of natural resources, the Provincial government has been involved since 1979 in the production of trees, primarily of exotic timber species, although with some native species in more recent years. The Forestry Department of Pichincha Province has also undertaken reforestation efforts in the peri-urban zone of Quito, with approximately 5000 ha. of reforestation documented throughout the Province as of the early 1980s (more recent figures were unavailable: Moreno, 1981). It is unclear what the participation of Pichincha Province in environmental management will be now that the new Metropolitan District has been created. · National Level: Interventions at the level of the central government of Ecuador have been significant in Quito's urban socio-ecosystem throughout history. These actions have included several important indirect measures such as agrarian reform policy and regional development plans, as well as significant municipal infrastructure investments, all of which have had great impacts on the patterning of both urban and rural land use throughout the country. In addition to these indirect ways of manipulating space, the national government has made some very direct policy moves related to land use in the peri-urban zone of the capital city. 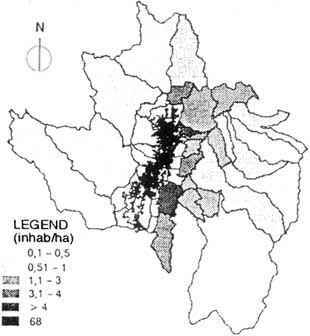 Perhaps most significant for the question of urban green issues was the designation by the Ministry of Agriculture and Livestock in 1983 and 1987 of significant blocks of nationally "Protected Forests and Vegetation" (Basques y Vegetación Protectores) directly surrounding the urbanized core of Quito (see Map 2.9). Serious landslides affecting urban neighborhoods in Quito throughout the 1970s and early 1980s provoked much citizen and official concern, and the original impetus for declaring this zone a protected area was to create a protective buffer against natural disasters arising from unstable soils on the steep mountain slopes above the densely settled central valley (MAG-DINAF, 1987). The Bosque Protector Pichincha was created in 1983, followed in 1987 by the designation of additional protected areas, which today total approximately 18,000 hectares (Metzger and Bermúdez, 1996). Together with other blocks declared as protected zones by the Municipality of Quito, these lands now form a 30,025 hectare continuous greenbelt ringing the city (IMQ, 1992d). The legal definition and status of "Protected Forest and Vegetation" within the overall Ecuadorian national parks and reserve system is an interesting one, since it is a designation which explicitly includes both public and private land holdings, and also allows for some continued productive use of the land. Although the Ministry of Agriculture has the authority and responsibility to require that a management plan be prepared in these areas, as of the mid 1980s, none of the existing Protected Forest and Vegetation areas throughout the country had yet produced a plan, and very few are in existence even today. 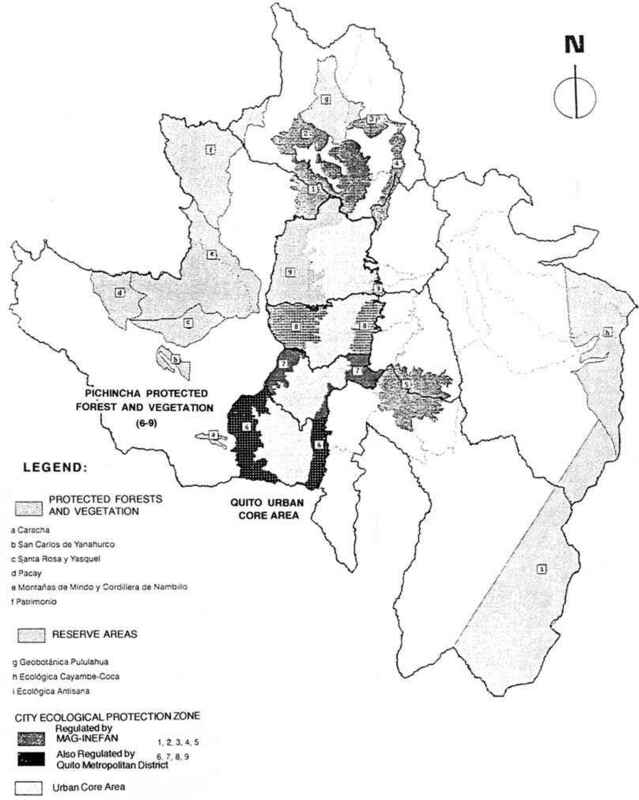 In 1984, Quito stood out as the first area of the country to actually prepare such a document for the Pichincha portion (western edge) of its Protected Forest and Vegetation area, largely because of the availability of financing from U.S. Agency for International Development (U.S. AID) to conduct such a study (Moore et al., 1984; MAG-DINAF, 1987). However, the management plan has been almost completely disregarded since then. If the lack of resources and political will on the part of the national government in this protected urban greenbelt continues into the foreseeable future, the Metropolitan District may have to take the lead in any practical management efforts conducted there. Additional national agencies with some jurisdiction over activities in the vegetative component of Quito's urban socio-ecosystem are discussed in Section 4 of this report.